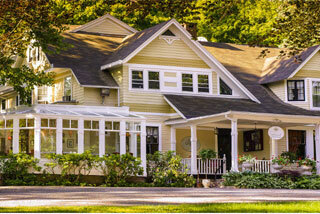 A country inn and renowned award-winning restaurant in Essex Connecticut, located in the beautiful Connecticut River Valley and along the Long Island Sound shoreline. This fine Ivoryton, CT bed and breakfast luxury inn is close to charming historic towns, shops, attractions and many outdoor activities. While enjoying this romantic getaway, you will appreciate easy access to the coastal towns of Mystic and the Essex area. Perfect for a honeymoon, anniversary, romantic weekend getaway, or relaxing vacation, The Copper Beech Inn offers peacefully luxurious accommodations and pampering service. 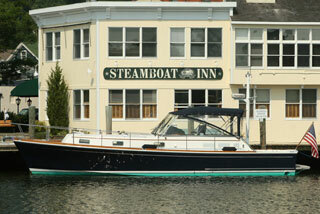 Steamboat Inn is Mystic's only waterfront inn. Elegant and intimate accommodations with fireplace, whirlpool baths, oversized showers, individual AC/heat, television, telephone, free WIFI, and a full breakfast served every morning. 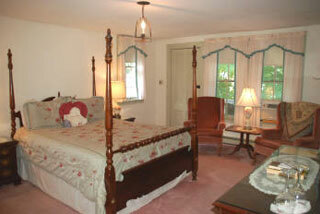 Rooms directly on the Mystic River in Historic Downtown Mystic - steps from numerous fine shops and restaurants. Our charming romantic Bed and Breakfast is the perfect choice for Mystic CT getaways and New England vacations near Mystic Seaport, Foxwoods Casino, and Mohegan Sun Casino. Originally a sea captain’s home, this unique, intimate Mystic property offers two Connecticut country inns in one – a sunny 1807 Georgian Colonial with wide plank floors and wood-burning fireplaces fondly referred to as the 1807 House; and the Yellow Barn, a newly renovated post and beam barn, featuring luxurious accommodations with whirlpool tubs and gas fireplaces. 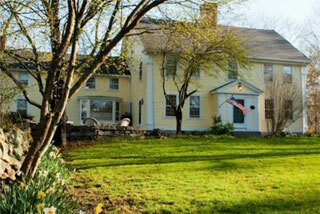 Built in 1784, the Main House is a picturesque country colonial tucked away in the quiet hamlet of Old Mystic. The Carriage House is located just behind the Main House and was built in 1988. Located just three miles north of Historic Downtown Mystic, visitors can experience the rest and relaxation the Inn offers while being only a short distance to local attractions, scenic views, shopping, and dining. With its huge maple trees, gazebo, and white picket fence, the Inn lends itself to the restful atmosphere often found in quaint New England towns.